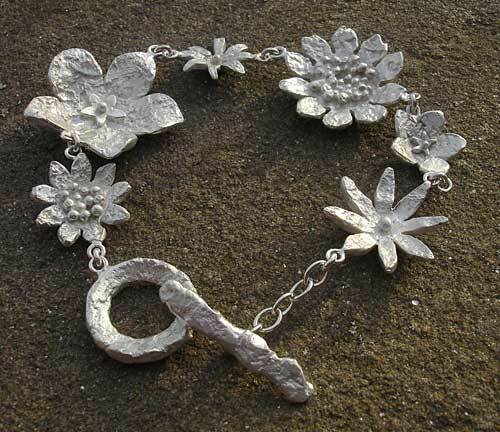 Women's Contemporary Silver Flower Bracelet : LOVE2HAVE in the UK! 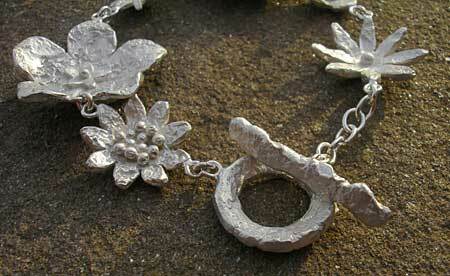 A luscious handmade women's contemporary silver bracelet consisting of spring flowers from the melt flower collection. It features exquisitely textured detail in solid sterling silver. The texturing of the bracelet is from our melt collection and boasts a rock-like fossilised appearance. The flowers are pimpernels, daisies and sunflowers. To give you an idea of their sizes the broadest flower measures approximately 27mm. The bracelet features a T-Bar fastener which holds securely and fits wrist sizes 5 to 7 inches. All of the flowers are available as individual necklaces and earrings that we also sell on our website, so they make very unusual jewellery sets for women. You can see from the choices below that customers have bought other matching products. They make great spring/summer sets for a fashion conscious lady. Size(s) Available: 5 - 7 inches.